Commission rates eat into profits. There is no doubt about it. People who invest in mutual funds are often paying enormous commission rates which many are unaware of. The same holds true for option traders. In Canada competition is limited among discount brokers so it is important to shop around. I think probably one of the best companies for keeping rates in check is Interactive Brokers. In Canada they charge in Canadian dollars which is a plus for Canadian investors. In the US, they naturally are charging in US dollars and seem to have the best rates of any brokerage. Like all companies, they have to make a profit somehow and one of the areas they make a profit in is with small charges for such things as being short stocks. Some clients pay as much as $8.00 a month to short a stock. They also have exchange streaming fees which depending on the number of transactions can be as high as $10.00 a month or more. Rates vary with differing brokers. I use Interactive Brokers for my Margin and US Portfolio accounts who I believe offer the lowest commission rates available. As I am in Canada, my retirement account cannot be held by Interactive Broker. My retirement account is with TD Waterhouse and in my opinion, while their customer service is very good, their commission rates and fees are far too high. Commission rates are very important when trading and you should seek a quality discount broker with decent commission rates. 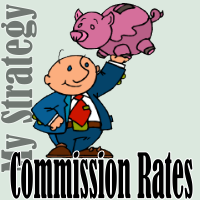 It is important to shop around and check commission rates among brokers. In Canada the field is somewhat limited and competition not as great as in the United States. Therefore some of the fees charged by Canadian discount brokers tend to be too high and definitely not fair to investors. For example at TD Waterhouse and I-Trade stock purchased are $9.95 or if you do more than 50 trades a month or 150 per quarter they charge $7.00 per trade. Interactive Brokers on the other hand charge 1 cent per share with a $1.00 minimum charge. Meanwhile Questrade is 1 cent per share with a $4.95 minimum and a maximum charge of $9.95. But when it comes to option trades the rates again vary widely. On top of the option commission charges, the assignment or exercise fee also varies widely. Interactive Brokers charges nothing for exercise or assignment. TD Waterhouse is a shocking $43.00 and some of the other banks are just as high. Meanwhile Questrade charges $12.00 for assignment or exercise. I had to call them to find out their assignment/exercise rates. They have a wide range of rates depending on how much money you have and the number of trades. You should consider calling and speaking with an account representative to get all their rates. Remember they charge in US dollars for Canadians, for ALL trades. Contact TD Direct at 1-800-668-1972 and they will direct you to all the information on Think or Swim Canada. It is best to call them and go over all their fees. Commission fees and various service charges are a big concern. Many of the discounters make it difficult to view all their various service charges. Everything from money transfers in and out to RRSP fees and much more, all add up. Personally I would like to see TD Waterhouse set their fees at $7.00 per trade, plus $1.00 per contract with an assignment charge of $15.00. That would make me a lot happier with my RRSP. TD Waterhouse is the largest discount broker in Canada. There is no other brokerage as large. In fact, there isn’t a brokerage that even comes close! They have 24 hour phone support, are great at transferring funds and can assist with just about any problem. Yet their fees are outrageous on things like exercise and assignment. In this low interest rate environment, I doubt the large discounters will reduce fees as they struggle to keep their profit levels up. If you find out that any links on this page are no longer current, please contact me and let me know. Thanks.